The Big DecisionThe cost of re-decking and painting the stripes is prohibitive in both Sweden, where Halberg Rassys are built, or in the UK. Even in the US, this type of work is beyond the reach of ordinary mortals. In Deltaville in the Chesapeake, we were quoted $10,000 by a boatyard just to have the 3 blue stripes redone. I kid you not! We decided not to request a quote for redoing the deck. On this side of the Atlantic, Thailand and Turkey have the best reputations for doing excellent wood work at affordable prices and as Thailand was out of the question, we decided on Turkey where we just happened to be located. During our travels we had met other boat owners who had had extensive work carried out on their yachts in Turkey and so were not too apprehensive at the notion of spending a rather large sum of money so far from home. 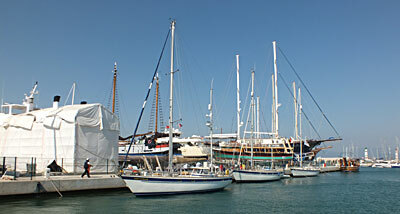 Having arrived in Kuasadasi in July of 2011, we quietly started researching the best boatyards. The choice was quite overwhelming but eventually we settled on Yachtworks which have yards in both Didim and Turgutreis and I am glad to say that we are delighted with the work they have just carried out. Yachtworks hangars. Note one set of our shelves emerging! Why ‘Yachtworks’ ?When we visited Didim for a couple of days in 2011, Can Surekli, managing director of Yachtworks, called down to Safari to say hello. He explained that he himself had a Hallberg and that his company had redecked a number of different models. He invited us to have a look around their workshops – 2 enormous “Hangars”, each capable of holding a dozen Safaris. All work would be carried out indoors. He gave us a list of other boats and their owners we could contact for their opinions. When we said we were interested, we quickly received a very professional quotation and he came up to Kusadasi to finalise matters. Language was not a problem as Can and his Project Managers spoke good English. In other words they inspired confidence! The Work begins Last October we left the boat in D-Marin, Didim in the care of Yachtworks with a long list of jobs we wanted carried out apart from the new deck. We are now the very proud and delighted owners of a completely refurbished Safari. The deck is simply top class. The paint job really freshens up the whole appearance of the boat as do the 10 new windows. The rigging has been overhauled and lots of other jobs, too numerous to mention, will hopefully ensure that Safari has many more years of safe and adventurous sailing ahead of her. No escaping lots of hard workIt was not all “plain sailing” off course. The task of emptying the boat in preparation for the work and reloading it again was truly daunting and exhausting. The contents of Safari occupied a storage room and two sets of shelves. Everything had to be boxed and wrapped and unboxed and unwrapped by ourselves. We naturally took the opportunity to do a major clear-out but nevertheless it has taken us 2 full weeks to get the boat back together again. Between bad weather when work was impossible and a most welcome visit over a few days with friends from Bulgaria, we have been hard at work since our return to Didim on April 6th. As the boat has to be more or less dismantled to have a new deck laid, the work of reassembling it again to the satisfaction of the owners is quite a challenge as every boat is set up differently. But the “niggle list” was eventually completed. No sooner was a problem mentioned than arrangements were made for the relevant worker to appear, tools in hand, to solve it. There were sometimes delays as this is the busy season for boatyards and that can cause frustration but the jobs do eventually get done. The Boatyard in DidimThe boatyard in Didim was truly amazing. There is a huge area for hard-standing with hundreds of mega motor and sailing yachts overwintering there. A 42 ft yacht like Safari looked like a toy boat when standing beside them. The President of Turkey overwinters his yacht here so Safari was in some excellent company indeed. The work was finally completed to our satisfaction on May 1st when we checked out of D-Marin and headed south for Turgutreis (close to Bodrum) on a mini shake-down cruise. I am glad to report that all went well on the 25 mile trip. There was a good north-westerly breeze which ensured that the boat was well tried and tested and Yachtworks do have another boatyard here if any problem had arisen during the passage. We were sad to take leave of our wonderful project manager, Tufan, who had worked tirelessly on our behalf during the winter sending us countless emails and photos of the work in progress. He was also at our beck and call for the past 3 weeks solving the long list of minor snags/niggles. Having a refit in Turkey? Yes, we would definitely recommend it. In the first place it represents great value for money, in particular for those whose pockets are no longer so large! There are excellent boat builders available with all the necessary skills to build and refit boats of all shapes and makes. So the price is right and the expertise is available. However, the downside is the lack of attention to detail when re-assembling the boat. The major work is without fault but a vigilant eye is needed to ensure that all the smaller tasks are carried out to one’s satisfaction. So it is advisable to allow at least two weeks for sorting out the final details after returning. In conclusion, it was a pleasure to do business with Yachtworks. They have excellent professional standards and the unfailing courtesy and good humour of Can and his staff helped to overcome any small moments of frustration. Our plan is to leave the Eastern Med and head slowly back to Sant Carles de la Rapita in Spain to arrive there by early July. We are checking out of Turkey today, May 2nd to head across the 5 mile stretch of water to the Greek island of Kos to begin what we hope will be a pleasantly adventurous sail across the Aegean, Ionian and Tyrrhenian Seas to the East Coast of Spain.